Why Do Some Christians Seem So Judgmental? 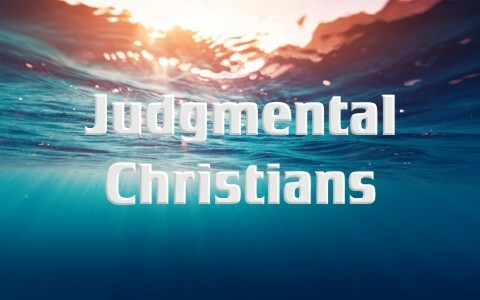 Why are some Christians more judgmental than most? What can justify their judging others? The Bible verse and actual quote of Jesus, “Judge not, that you be not judged” is taken out of context quite frequently, especially if someone’s caught doing something wrong. The actual verse is a lot more than “Judge not, that you not be judged.” Jesus said, “Just not, that you not be judged. For with the judgment you pronounce you will be judged, and with the measure you use it will be measured to you” (Matt 7:1-2). The context is seeing a brother or sister in sin, and so Jesus said that if you want to judge correctly, you must “take out the log that is in your own eye” (Matt 7:3b). It’s like someone living in adultery trying to judge someone who told a lie. Both are sin, but living in actual, physical adultery is being joined together with a harlot (1st Cor 6:16), and it is far more serious because they’re sinning against their own body. Then you hear, “All sins are the same,” but is that true? Adultery was punishable by death but if someone stole something, they could make restitution. The adulterous person is not qualified to judge someone else doing something less sinful. Yes, sin is sin, but not all sin is equal, so as Jesus said, if you see a brother or sister in sin, go to them. And if that doesn’t work, take one or more witnesses with you, and if that doesn’t work, bring it to the attention of the whole church (Matt 18:15-18). Jesus gave the church that kind of authority (Matt 18:19-20). The idea is not to condemn them, but to have them repent, confess it, and be joined together again with the Body of Christ, the church. So it’s not “Judge not and you shall not be judged,” but remove the log (sin) out of your own eye, “then you will see clearly to take the speck out of your brother’s eye” (Matt 7:5). When we approach our brothers and sisters, make sure we’re not hypocrites doing the same thing, or something far worse (Matt 7:5a). You can’t see other people’s faults when you’re vision is impaired by your (and my) own sin. We know that judgment starts in the house of God, but does it stay there and move out into the streets, meaning the lost? When a person is brought to repentance and faith, the judgment they formerly had abiding on them (John 3:36), is lifted. The Apostle Paul says, “There is therefore now no condemnation for those who are in Christ Jesus” (Rom 8:1), and since we have made peace with God through Jesus Christ (Rom 5:1), we ought to rejoice and thank God. God’s Spirit quickened us, or made alive together in Christ (Eph 2:1-5). Judgment, as we have read, still occurs in the church, as church leadership has the God-given responsibility to keep the church pure or holy. No, not sinless, but members who are not living in serious sin. Not those who fall into sin, because we all do, but when sin is allowed to go unchecked in a church, as Paul said, it acts like leavening or yeast, and it spreads throughout the whole church. One member might think, “Well, if they’re doing that and they’re a Christian, then it must be fine for me to…(fill in the blank).” Sin deceives us, it entangles us, and it can be very sneaky. When we sin and don’t repent or confess it, we form a little bit of callous over our heart, and the Spirit is grieved and cannot do what He desires to do in us. Sin quenches the Spirit’s fervency in us, sin grieves Him as we grieve a lost loved one, and sin desensitizes us to make it even easier to sin next time. In time, a callous heart, like calloused hands, will begin to fell no conviction to sin since the Holy Spirit is not able to be heard. Does judgment start in the house of God? The Apostle Peter wrote, “For it is time for judgment to begin at the household of God; and if it begins with us, what will be the outcome for those who do not obey the gospel of God” (1st Pet 4:17)? Since judgment has already occurred in the house of God, or the church, can you imagine how severe the judgement of God will be on “those who do not obey the gospel of God?” God’s judgment comes upon all who refuse to repent and believe, which is the essence of what Jesus said is the gospel (Mark 1:14-15), but does this mean we go out and start telling people they’re all condemned to hell if they don’t repent and believe? Probably not exactly in that way, but the whole gospel must be preached, like the wrath of God on unrepentant sinners (Rom 2), that not one of us is good enough to go to heaven on our own (Rom 3; Eph 2), and that the wages we deserve is eternal death (Rom 6:23), but when you’ve slain the lost sinner, and they say, “What shall I do?,” then you offer the cure; believing in Jesus Christ and being saved (Acts 4:12; Rom 10:9-13). Trusting in Him and not in your (and my) own works. The whole gospel includes repentance, confession, sin, hell, the atonement through Jesus’ shed blood, and being saved by the free gift of grace (Eph 2:8-9). Why are some Christians so judgmental? Maybe they haven’t stopped to consider their own sins and Jesus’ great humility in taking our sins upon Himself (Phil 2). If someone is sinning, go to them, take someone else with you if you can’t talk some sense into them, and if necessary, bring it to the church’s attention, but when we judge other believers over non-essential doctrines, it’s like we’re children sword fighting with the Word of God, tossing volleys, one after the other, using Bible verses like a weapon. If we have sin in our own life (we all sin) then let us be careful to check our own life for any hidden logs. Remember, these logs can blind us to the reality of others and can deceive us. It‘s too easy to magnify what some other believer is doing, when we don’t see up close that we ourselves are blinded by sin. We have no business judging the lost. Let the Spirit of God convict them, let the Word of God change them. As for our brothers and sisters, judge not…unless you can see clearly enough to judge righteously…not condescendingly, but with an eye on our own sins, lest we too become hypocrites. Next post: Why Don’t Christians Look More Joyful?